Teraprom leases hunting properties as well as a camping and fishing property ranging in size from 1 acre to 200+ acres. Our approach to hunting leases is to lease the ground to you so that it is essentially yours for the time that you lease it. We will give you a tour of the property and show you where the boundary lines are, but after that, it's up to you to create food plots and trails and determine the best stand locations. Properties listed on this page are owned by Teraprom as well as third party landowners for whom Teraprom manages the leasing of their land. Our leases tend to be taken up quickly, so contact us soon if you are interested! If you would like to be added to our hunting lease waiting list, be sure to fill out the brief form at the bottom of this page and let us know which properties you are interested in! The Ford 15 is a great property surrounded by some of the largest timber Schuyler county has to offer. Filled with ridges and ravines this property lays out a whole lot larger than one would expect. Nice thick timber with a creek running through the bottom. As hunters know there are three things wildlife need and thats food, water, & bedding. We have 2 of the 3. There is a small 2 acre grassy area on the north side of this property you could put a food plot on if you desired giving you all 3 ingredients to feed, water, and hold all the wildlife you want. The Scab Hollow 5 tract is less than 1 mile away from the Layne Farm and Poverty Point. Set in a beautiful creek valley with spectacular views, it features dense brushy areas on the west side with majestic hardwood timber as you move to the east side of the property. It has excellent access along Scab Hollow Road (its namesake), which is a quiet gravel country road with little traffic. The property is located in a secluded part of Schuyler County, where there is abundant native wildlife including whitetail deer and turkeys. With hillsides, creekbottoms and dense thickets, this is a top notch hunting property in the Golden Triangle! These four tracts are all located relatively close to one another in Southern McDonough County, near the Schuyler County line. 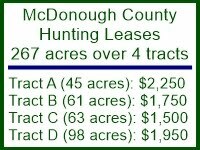 You can lease any of the four tracts individually or lease all of them together. These leases will run for 12 months. Contact us soon if you're interested in these leases as we don't expect them to be available for long! This 101 acre tract offers it all in terms of hunting and recreation potential! It is a large and long tract with tons of edge habitat and field coves. You would be surprised how large the field actually is when you walk it. The layout of the property is best suited to hunting field edges as the wooded areas are quite steep and there is a fair amount of blowdown of trees in the woods due to a very strong wind storm that passed through the area a few years ago. This property is conveniently located on Route 67 between Rushville and Beardstown in Schuyler County. Excellent access and parking on the west side of the property by a gravel road. This is one amazing hunting property with many diverse habitat types and terrain changes. It is absolutely LOADED with deer trails and deer sign! Large and beautiful Grindstone Creek is a defining feature of the property, passing through the entire property and providing a year round water source to wildlife. The property is loaded with upland timber, bottomland timber, 10 acres of tillable acreage and a number of small wetlands adjacent to Grindstone Creek. The tillable acreage is planted in row crops by a local farmer and provide a great food source to deer, not to mention the numerous agricultural fields that adjoin the property. The Layne Farm is a beautiful 107 acre tract located northeast of Rushville, Illinois. The land is located in Schuyler County, Illinois which offers some of the best whitetail deer hunting in the world. It is extremely secluded and features nine acres of pine trees and brushy cover where deer love to hang out. There are approximately 9 acres of pine trees which were planted more than 30 years ago as part of a tree farm program and it has since become incredible habitat. It is very rare to find such a large and mature stand of conifers in the middle of an Illinois hardwood forest. This is our most scenic, beautiful property! This 91.5 acre tract features a nice combination of timber and tillable acres, with a roughly 50/50 split between the two. The tillable acres are comprised of two separate fields which are planted to corn AND beans each year. This is a very unique aspect of this property which you just don't find in properties this size. This property is located right across the road from the 101 acres listed on this page. It is conveniently located on Route 67 between Rushville and Beardstown in Schuyler County with excellent access through a gated entrance located on a gravel county road. If you are interested in leasing hunting, camping or fishing property but we don't have exactly what you are looking for right now, please take 30 seconds and fill out the easy-to-use form below and we will contact you when something becomes available that meets your needs. You can also contact Matt Anderson by email at manderson@teraprom.com or by phone at (217) 719-0864. We lease properties from 1-200+ acres in size so we will certainly have something that meets your needs sooner or later.